Are you scheduled to undergo thyroid surgery and mulling over the potential complications? Any type of surgery has its risks and is always a cause for concern. In France, each year, 10,000 cases of thyroid cancer are diagnosed and 45,000 people have a thyroidectomy (complete removal of the thyroid gland). The thyroid is a small butterfly-shaped gland at the base of the neck. Essential for the body to function properly, this endocrine gland secretes two types of hormones, namely T4 (tetraiodothyronine) and T3 (triiodothyronine). These hormones regulate many vital bodily functions including metabolism, body temperature and heart rate. Proper functioning of the thyroid depends on another gland called the pituitary gland. Located at the base of the skull, the pituitary gland produces the hormone TSH which regulates metabolism and the secretion of the thyroid hormones T3 and T4. When the thyroid isn’t working properly and malfunctions, two things can happen. Either it makes too much of the thyroid hormones (hyperthyroidism), or it doesn’t make enough (hypothyroidism). There are many pathologies associated with thyroid disorders. Differentiated thyroid cancer is more common and has a cure rate of 85%. Undifferentiated thyroid cancer is more difficult to treat and mainly affects older people. Thyroiditis of pregnancy: some women experience hyperthyroidism for a few months after giving birth. Hypothyroidism is treated with synthetic hormones (Levothyrox is the most widely known medication) to restore adequate levels of T4 (tetraiodothyronine). The dose is determined by the endocrinologist according to your weight, height and age. Hyperthyroidism is more difficult to treat: antithyroid medications counteract the overproduction of thyroid hormones. Radioactive iodine is used as curative treatment to kill off any remaining cancer cells and to destroy suspicious or toxic nodules. Operating on the thyroid: why is there no such thing as zero-risk? Surgery is often indicated when cancerous or precancerous nodules are detected or when a goiter becomes too large and symptomatic. 95% of thyroid nodules are benign, and 5% are cancerous. 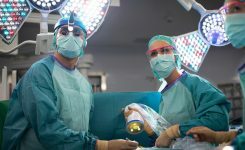 Surgical removal of all or part of the thyroid gland is a procedure that can cause postoperative complications, even when performed by an experienced surgeon. One risk of this type of surgery involves inadvertent damage to the pharyngeal nerves, although this is a rare occurrence (5% of cases). These nerves are located just behind the thyroid gland and are exposed during surgery. For weeks following the operation, patients experience hoarseness and vocal fatigue. Hypocalcemia (abnormally low level of calcium in the blood) is another possible complication of total thyroidectomy. It is caused by trauma to the parathyroid glands. These tiny glands, partially hidden by the thyroid, are difficult to locate during surgery and may therefore be inadvertently excised. Hypocalcemia is usually temporary but if the parathyroid glands are damaged or accidentally removed, hypocalcemia may be permanent and require lifelong hormone replacement therapy. As with any surgical procedure, there is a risk of hematoma (an accumulation of blood near the operating site) and infection. In some cases an emergency procedure may be necessary to evacuate the hematoma and rapidly identify the bleeding vessel. Identification of the parathyroid glands – of which there are usually four – during surgery is often challenging even for skilled surgeons due to their small size. This is why they may be accidentally damaged or excised, leading to postoperative complications. To facilitate the surgeon’s work, researchers have developed an innovative system for use in endocrine surgery. This technology, already used by numerous medical teams in Europe and the United states, enables real-time identification of the parathyroid glands thanks to the phenomenon of natural autofluorescence. This innovation, integrated in the FLUOBEAM® fluorescence imaging solution developed by the French company FLUOPTICS©, makes surgery safer by enabling surgeons to accurately visualize the parathyroid glands which are usually difficult to detect. Another advantage of this fluorescence imaging solution concerns parathyroid gland vascularization. FLUOBEAM® enables surgeons to clearly visualize the vascularization of the parathyroid glands to assess their viability on completion of the surgery. What is the cost of the FLUOBEAM® fluorescence imaging system to the patient? This instrument means that surgeons can operate in safer conditions and significantly reduces the rate of postoperative complications. This innovation benefits everyone at no additional cost to the patient. Autofluorescence imaging is a breakthrough innovation for endocrine surgery. Non-invasive for the patient, FLUOBEAM® makes thyroid surgery safer and in doing so it significantly reduces the risk of postoperative complications such as hypocalcemia. FDA certified for the US market, the FLUOBEAM® fluorescence imaging system is unique and thefirst in the world that detects parathyroid tissue in real time during surgery.